Monroe Partners Architects created a rendering of the proposed Hiawatha Lane development in Westport which was released to the public in May 2018. 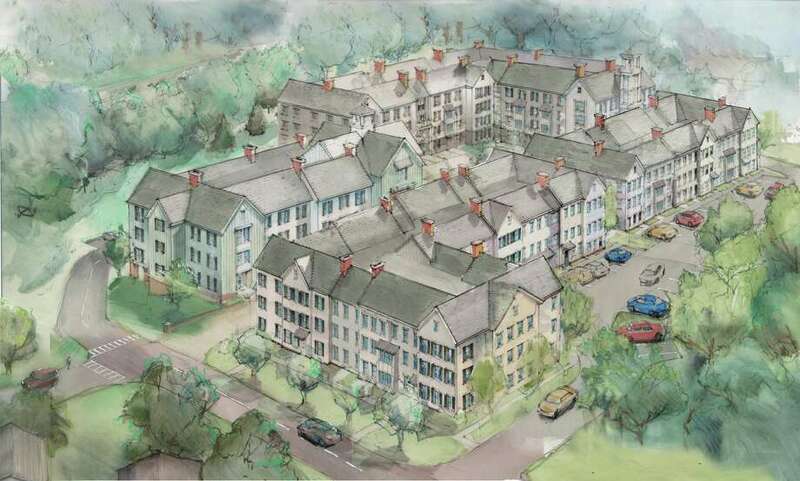 WESTPORT — Five large-scale affordable housing applications are still vying for approval in Westport despite town’s receipt of a four-year moratorium on 8-30g applications. “Those may or may not come to fruition as proposed, but they’re still real projects under the 8-30g regulations,” Westport First Selectman Jim Marpe said. On March 15, Westport received a “Certificate of Affordable Housing Completion” from the state Department of Housing, which granted the town a four-year moratorium on 8-30g applications. However, the moratorium only applies to projects proposed as of March 15 and does not impact those five 8-30g applications submitted to the town before then. The five proposed developments — 1480 Post Road East, 28-47 Hiawatha Lane, 20 and 26 Morningside Drive South, 122 Wilton Road, and 1 Lincoln Street, are either currently going through the town land-use approval process or in litigation with the town over a denied application. In municipalities that don’t have enough affordable housing in the eyes of the state, any 8-30g application brought before a town or city’s zoning board can skirt local building regulations and only be denied on traffic, safety or environmental grounds. To be compliant with the 8-30g statute, applications must designate at least 30 percent of the development’s units affordable. With a moratorium, Westport will now be able to apply its local regulations, such as those related to building size, to development projects proposed in the future, but five applications submitted before that date must be reviewed based on the criteria of 8-30g. Of the five applications, three are still under review of the Planning and Zoning Commission. The newest application, for a development with 18 one-bedroom and 14 two-bedroom units at at 1480 Post Road East was submitted by 1480 PRE Associates, LLC on Jan. 28. A 187-unit development on Hiawatha Lane was brought to the town by Summit Saugatuck LLC on Nov. 16, although the Hiawatha neighborhood’s fight to prevent a development in the area goes back 15 years. The third application still in process, submitted by Morningside Homes LLC on Oct. 11, proposes 19 condos on the property of a historic Greens Farms home at 26 Morningside Drive South that would be demolished in order to make way for the development. Many of the 8-30g applications rejected by P&Z are challenged by the developers’ lawyers in the state Superior Court in Hartford, which handles the state’s affordable housing cases. Two 8-30g applications that were denied by the P&Z last year are currently in litigation. The 81-unit development proposed by Cross Street LLC for Lincoln Street, near the Saugatuck River, has a set trial date in Hartford of Dec. 11. The other application in litigation — a 19-unit development at 122 Wilton Road, brought by Garden Homes Management Corporation, will likely go to court in Hartford against Westport in January of next year, Town Attorney Ira Bloom said. First Selectman Marpe has openly discussed his frustration with the 8-30g statute and its impact on Westport, but he said if the pending projects come to fruition, they can count toward a second four-year moratorium to succeed the current allowance against 8-30g applications.